On December 5th NBC aired a live presentation of “The Sound of Music”, a 3-hour spectacular. This was a massive undertaking (reportedly costing 9 million dollars). Live TV productions of this magnitude ended many decades ago with the advent of modern recording equipment. There have been programs with the tag “recorded live”, which is a paradox since a taped production can be edit for errors. But, with the full cast including 7 wonderful children memorizing their lines and song lyrics, the program was amazing. If there were errors they would have only been noticed by the cast members themselves. There must have been unbearable pressure for all the cast and crew, having only 2 minutes of commercial time-outs to prepare for the next scene. Can you ladies change your dress and “do your hair” in a different style in two minutes – and get to the next set?? NBC is due plaudits for the production. I haven’t checked where the live performance occurred but they must have a massive sound stage. Just the hall in the abbey was probably 200 feet long. And opening wall panels to step into the next scene was creative. An outstanding performance was given by Audra McDonald, who played (and sang) the role of “Mother Abbess”, herself a 5-time Tony award winner. But. 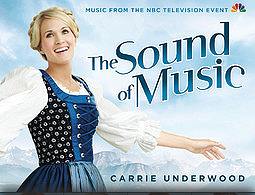 clearly the star of the show was Carrie Underwood as Maria von Trapp. Julie Andrews, who played Maria in the 1965 film version, gave the country star her blessing to climb every mountain and share a few of her favorite things. Although there were (and are) critics to Carrie playing the role of Maria, her performance only exhibited her versatility. She rose to fame as the winner of the fourth season of American Idol in 2005 and has since become a multi-platinum-selling recording artist, a winner of six Grammy Awards, sixteen Billboard Music Awards, seven American Music Awards and ten Academy of Country Music Awards, among several others. In short, she was well-qualified for the role! Amen, sister, and keep up the good work! Some material courtesy of NBC.com.